Even with their rapid leap into success, they are not without their weaknesses (who isn’t?). Whether your facility is a traditional park, or a full blown family entertainment center with multiple attractions, it’s essential for you to stay relevant and in front of your target market. 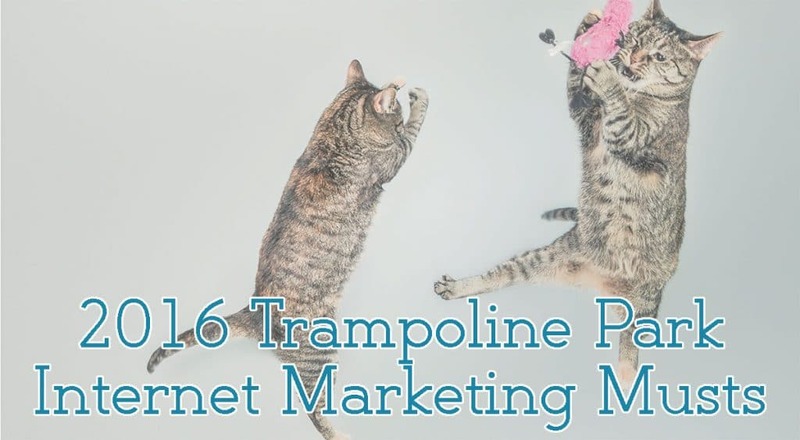 While adding a ninja course or laser tag arena to your facility might be on your wish list this year (we know some pretty awesome people that can help with that), smart Internet marketing for your trampoline park can’t be set aside for another day. If you’re a franchise owner, this is where you can provide your franchisees with real support. Reputation Management: The IATP (International Association of Trampoline Parks) has done an amazing job of pulling together parks to improve safety standards and grow the industry. Individual parks still run into constant issues with online reviews, just like every other family entertainment center. When you add the fact that trampoline parks are extremely popular right now, it should be expected that there will be hundreds, if not thousands, of online reviews of individual parks this year. Sticking your head in the sand is not an option. Taking online reputation seriously is a must in 2016. Local Advertising: Paid advertisements can yield amazing results for trampoline parks. However, trampoline parks, especially the large franchises, might be missing huge opportunities when it comes to targeting for their locations. Ensuring that your local advertising dollars are reaching your local market should be a major priority so that you can stretch your dollars further and connect with people that matter to your community and bottom line. Personalizing your Internet marketing using social media advertising will be a recurring theme in 2016. Don’t miss the opportunity. Knowing Your Numbers: TrustWorkz team members know that there are two things that matter to business owners: results, and their perception of those results. Your business could be achieving the impossible. However, that doesn’t mean a single thing if the owner, or decision maker, isn’t aware of the actual results to the bottom line. Understanding your marketing results will help you make sound business decisions and drive your trampoline park to the next level. Whether you are a franchisee or an independent trampoline park owner, you are faced with a huge opportunity. While the industry continues to grow at a rapid pace, parks that differentiate themselves with great customer service and a stellar online presence will shine above local competition. If you have questions about your location or franchise, contact TrustWorkz today!